Motovun - best preserved medieval fortified town in central Istria. The monument with great historical heritage. 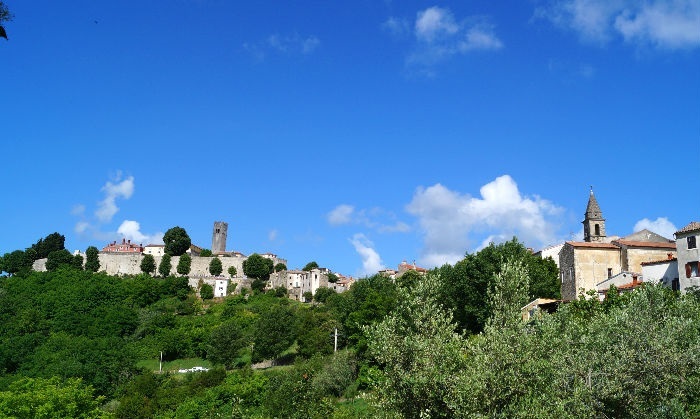 Anyone visiting Istria simply must come to Motovun and experience the authentic atmosphere of the town, within the walls are designed like a ring and internal walls shaped like semicircle, which surround the old town. Besides the historical significance of Motovun there are many traditional customs and values that are passed on to generations to generations. Motovun natural environment is truly spectacular. View from the walls of the Mirna valley is breathtaking. Vineyards (Motovun Teran, Pinot and Malvasia), fields, olive groves, old stone buildings, estates, historical railroad Parenzana are landscapes that best describe the Motovun area. Once, the city of nobles, rulers and administrative center of Venice, has left many monuments, churches and sacred treasures. Motovun Forest, with the afforested area of 986 hectares, which stretches along the Mirna river valley, the most famous habitat of truffles, underground fungi that are attributed aphrodisiac effects. Quality Istrian white truffles, whose season is from September to December, according to many it can be compared with that of the finest Italian and French truffles. With Motovun is connected and the legend of the giant Veli Joze, in which the stories written by Vladimir Nazor.